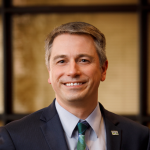 William Murdock serves as executive director of the Mid-Ohio Regional Planning Commission (MORPC), a voluntary association of more than 60 Central Ohio local governments and regional organizations serving the fastest-growing region in Ohio. As executive director, Murdock oversees innovative planning, services, and policies in transportation, energy, housing, land use, environment, and data. In his time at MORPC, Murdock has reorganized MORPC’s committees and staffing team to sharpen its focus on collaborative partnerships and local government services. He is responsible for the development of MORPC’s long-range transportation plan that coordinates over $20 billion of transportation improvements across the region through 2040. Murdock spearheaded the launch of insight2050, a public/private initiative to prepare for Central Ohio’s significant growth and development. He also directed the creation of Central Ohio’s first Regional Energy Plan and strengthened MORPC’s advocacy efforts at the state and federal levels. Prior to joining MORPC, Murdock worked for over 15 years in state and local government in planning and economic development. Murdock is actively involved in a number of local, state, and national organizations. He is secretary/treasurer for the Ohio Association of Regional Councils, a governor’s appointee to the DriveOhio Government Advisory Board, a board member of Partners Achieving Community Transformation (PACT), past president of The Ohio State University Knowlton School Alumni Society, and past chair of the National Association of Regional Councils’ (NARC) Executive Directors Council (EDC). Murdock is a longtime resident of Central Ohio and proud “buckeye” with multiple degrees from The Ohio State University. Kerstin Carr is the director of MORPC’s Planning & Sustainability Department and has been with MORPC for over 12 years. Her department provides and promotes collaboration, technical assistance, and regional planning initiatives related to active transportation, the natural and built environment, transportation safety, and energy to benefit MORPC members and communities in Central Ohio. Carr has nearly 20 years of experience in transportation and urban planning. She currently is a board member on the Neighborhood Design Center, serves as the chair for the Scenario Planning Consortium of the National Association of Regional Councils, and is a participant of Leadership Columbus. Carr is a graduate of the University of Regensburg, Germany with a Doctoral Degree in Geography. Shawn Hufstedler has been with MORPC since 2009. His duties include: providing staff internal support for the executive director; serving as executive director in his absence; providing administrative direction for agency governmental affairs and activities; and directing and coordinating the IT, finance, HR, and facility activities of the Operations department. 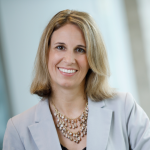 Previous to MORPC, Hufstedler served as the director of finance and grants at the Community Shelter Board and as an assurance manager for KPMG LLP. A Certified Public Accountant (CPA) and Certified Government Finance Manager (CGFM), he is a member of the Association of Governmental Accountants Central Ohio Chapter, the Government Finance Officers Association (GFOA), the Ohio GFOA, the Ohio Society of Certified Public Accountants, the Society for Human Resource Management, and the Human Resources Association of Central Ohio. 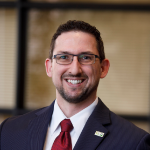 Hufstedler serves on the Ohio GFOA Board where he co-chairs the Early Career Professionals Committee. He previously served on the First Night Columbus Board. Hufstedler is a graduate of The Ohio State University with a BS in business administration with finance and accounting majors. Níel Jurist is the director of MORPC’s Communications & Engagement Department. In this role, she serves as the agency’s chief communications officer and oversees the agency’s public information, engagement, membership, and events programming. Jurist’s career spans more than 15 years of progressive experience in marketing and communications. Prior to MORPC, she served as the public information manager for the City of Gahanna. Most of her career has been in local and state government, where she held similar positions at the Ohio Treasurer of State’s Office and the Ohio Senate. In addition to her tenure in government, Jurist held similar positions at the YMCA of Central Ohio, Franklin County Children Services and served as the assistant director of diversity and inclusion for the United Way is Central Ohio. Jurist received her Master of Business Administration (MBA) from Ashland University and is also a proud graduate of The Ohio State University, with a bachelor’s degree in criminal justice. She holds certifications in crisis communication, media training, measurement and analysis, and risk reputation management. Aaron Schill oversees MORPC’s Data & Mapping Department. Drawing on his experience in community and demographic data analyses, research methodology, GIS, land use, and transportation planning, Schill leads MORPC’s work in data analytics and visualization processes, including GIS. His team supports the data and mapping needs of the rest of the agency, MORPC members, and the broader Central Ohio region. Prior to joining MORPC, Schill worked as director of community foundation insights and knowledge services at Foundation Center, director of research and data services at Community Research Partners, assistant development director/city planner for the City of Newark, and as a planner with Stantec Consulting. He is a two-time graduate of The Ohio State University, where he received a bachelor’s degree in sociology and a master’s degree in city and regional planning. Thea Walsh leads the transportation planning efforts for both the agency’s Metropolitan Planning Organization and the Rural Planning Organization. Walsh is a 17-year public servant focused on transportation, economic development, and community planning. She has worked at county, regional, and state levels of government. 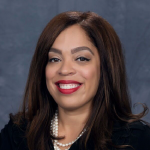 Thea has a BA in Public Administration and Urban and Regional Planning from Miami University and a Masters of Public Administration from Wright State University. In 2017, Thea was selected by Columbus Business First as one of the Forty Under 40 Honorees for being a “mover and shaker” in the Central Ohio community –most notably for her role in Smart Columbus, the Hyperloop Midwest Connect proposal, and a Downtown Employee Bus “C-Pass” Program. She is in the American Institute of Certified Planners, in the Ohio Association of Commodores, and is the current chair for Clean Fuels Ohio. Robert Williams leads MORPC’s Residential Services Department. Robert’s primary duties include providing support for the Home Repair, Energy Efficiency and Weatherization Programs. These grant programs are essential in providing assistance to county residents who have housing and weatherization needs that help stabilize their homes and reduce energy costs. 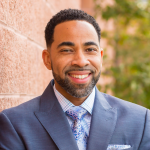 Prior to MORPC, Williams served as the executive director for Nationwide Children’s Hospital’s non-profit housing initiative, Healthy Homes, and as the sales coordinator at Homeport. He serves as a board co-chair for Resident Resources Network (RRN), a non-profit that connects residents of Wallick Communities to supportive services. He is also a board member of the Hilltop Shalom Zone. Williams is a graduate of The Ohio State University with a BA in English, as well as a master’s degree from Franklin University in marketing and communications.